Dungeness is a vast expanse of shingle ridges, built up over the centuries by longshore drift. By the end of the medieval period it had grown into a promontory reaching out into the English Channel and had become a lethal and dangerous shipping hazard. Advances in marine technology during the 16th century had led to a large increase in both the number and size of ships in the English Channel. It is said that during one winter gale over 1000 sailors lost their lives and many valuable cargoes sank with them. The first lighthouse, simply a wooden tower, probably 35ft high, with an open coal fire on top, was licensed to private ownership, by King James 1 (V1 of Scotland) in August 1615. Time passed and the sea continued to retreat as the shingle banks grew. A second brick lighthouse , approximately 110ft high was constructed around 1635. This second lighthouse lasted over 100 years, but it too became victim of the increasing shingle banks and after complaints about poor light visibility at sea a new third Lighthouse was demanded by Trinity House, and built in 1790. This third Lighthouse, some 116ft tall, similar in design to the Eddystone light, was lit by 17 Argon lamps, fuelled first by oil and finally petroleum. The light was magnified by silvered concave reflectors. 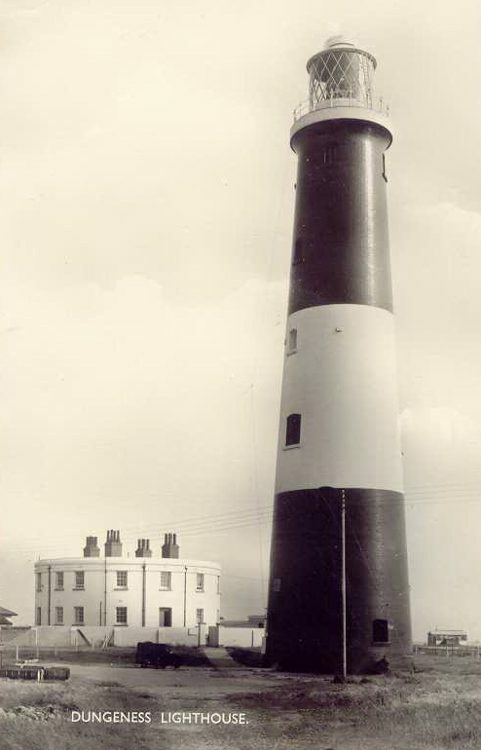 In 1836 Trinity House, empowered by an Act of Parliament, bought out all Lighthouse Leases and in 1862 pioneered commercial electricity by introducing it at Dungeness. Electrical power supply however, was in its infancy and it eventually proved too costly. The oil light was restored but this time surrounded by much improved glass prisms. Towards the end of the 19th Century the shingle bank had increased to such an extent that an additional smaller Low Light became necessary and was placed near the waters edge. A siren-type foghorn, presented for trials by the United States Lighthouse Board, was housed in the same building. In 1901 Trinity House commissioned Patrick & Co of London to build a new, taller fourth lighthouse, approximately 150 ft high. This Lighthouse was ceremonially opened by His Majesty, The Prince of Wales, later George V, in 1904. Its intermittent light, flashing every 10 seconds could be seen for approximately 18 miles. During the late 1950's work began on the Dungeness Power Station and it became apparent that, due to the height of the new building, the light would be obscured from the sea. Subsequently a fifth and automatic lighthouse was built closer to the waters edge where it operates from today. Thus, the fourth lighthouse, now known as the Old Lighthouse, was decommissioned in 1960 and became a tourist attraction and museum. Ben Fogle and his dog Storm visited recently as part of the Channel 4 series "Walks With My Dog". The BBC also recently filmed as part of the series "Holiday of My Lifetime" featuring Len Goodman and Bill Oddie. 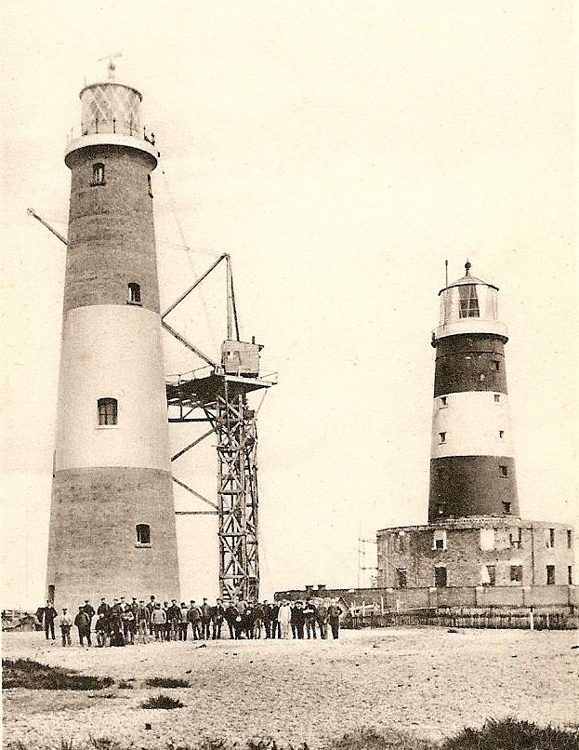 More information on the Old Lighthouse can be obtained from the booklet "Dungeness Lighthouses" available from our shop.